One of the many reasons I'm excited for Kingsman: The Golden Circle is its amazing ensemble; in addition to returning cast members Taron Egerton and (surprisingly) Colin Firth, the sequel will also introduce franchise newbies Julianne Moore and Channing Tatum. 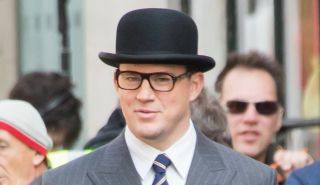 The latter is currently filming Kingsman 2 in the UK, and (as documented by ComingSoon) he was recently spotted wearing a dapper suit on set. We still don't have many details as to who Tatum is playing, although the popular rumour is that he'll be an American agent. In any case, his inclusion is further cause for excitement; the actor has impressed in many roles recently, and I'm intrigued to see how director Matthew Vaughn plans to use him in the Kingsman franchise. Directed by Matthew Vaughn and starring Taron Egerton, Mark Strong, Halle Berry, Channing Tatum, Pedro Pascal, Colin Firth, and Julianne Moore, Kingsman: The Golden Circle will be released in cinemas on June 16, 2017.